Alienware's redesigned powerhouse laptop promises the Holy Grail of gaming laptop features. The proving ground of any gaming laptop is always in performance. Our Area-51m's Intel Core i9-9900K CPU packs 8 cores plus Hyper-Threading. The main difference between a mobile CPU and a desktop CPU (besides the ability to change it) is the number of cores. The top-of-the-line laptop Core i9-8950HK offers 6 cores with Hyper-Threading. While the mobile CPU has decently high clocks, it can't keep up when you need more CPU threads. 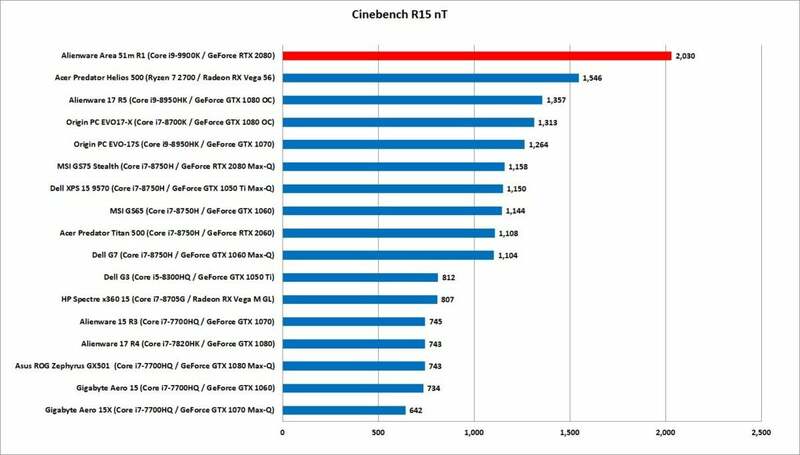 You can see that in our Cinebench R15 test run, where the desktop Core i9 simply pounds all others. While you should expect a Core i9-9900K to dust off a 6-core Core i7-8750H, the real eyebrow-raiser is how well it dispatches that Core i7-8700K in the Origin EVO-17X, the Core i9-8950HK in the Alienware 17 R5, and the Ryzen 7 2700 in the Acer Predator Helios 500. That last CPU, mind you, is an 8-core desktop chip as well. 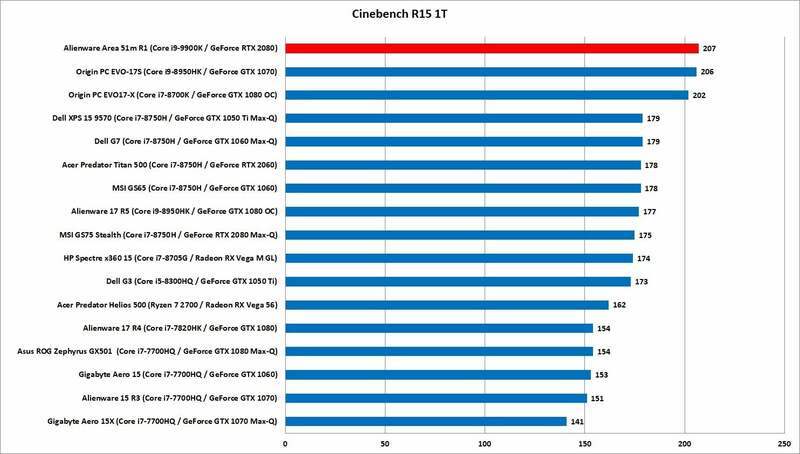 Performance of the Core i9-9900K in Cinebench is basically a half-step back from what we've seen from a bone "stock" Core i9-9900K in a desktop. The desktop Core i9-9900K easily outpaces other desktop CPUs, including a Ryzen 7. Because most apps rarely use all cores, we also look at single-core Cinebench performance. Although the test is a 3D modelling benchmark and doesn't necessarily represent performance in all apps, it's still a good way to judge what you might see in Photoshop or, say, Chrome. You see all of the CPUs push their top clock speeds, and we essentially see a three-way tie between the Core i9-9900K, the Core i9-8950HK, and the Core i7-8700K, each of them at or near their max. If Ryzen 7 in a laptop is expecting to compete, it'll have to run at higher clocks than what we see here. Single-threaded performance basically sees a three way split between the top-end Intel chips. Our last CPU test uses HandBrake to convert a 30GB 1080p video using the Android Tablet preset. This test can take 30 minutes to run, heating up the CPU for a longer period than Cinebench R15 does in its one-minute run. 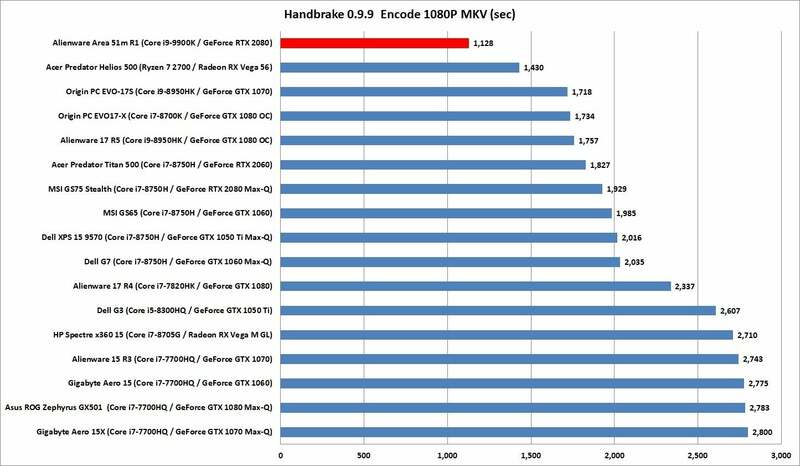 Because HandBrake favors more cores, it's no surprise that the Core i9-9900K again drop-kicks the 6-core CPUs. It also has a pretty hefty lead over the 7-core Ryzen 7 2700 in the Acer Predator Helios 500. We'd credit this to two things: the higher clock speeds, and the cooling system in the Area-51m, which can take HandBrake's longer load in stride. Now on to the main attraction: gaming performance. First up, we take a look at UL's 3DMark FireStrike. For this DX11 test, we'll look solely at the graphics score, which cuts the CPU out as a factor. Yet again (as it should be) the Area-51m's RTX 2080 is the top dog, with a healthy uptick even compared to overclocked GeForce GTX 1080 laptops. 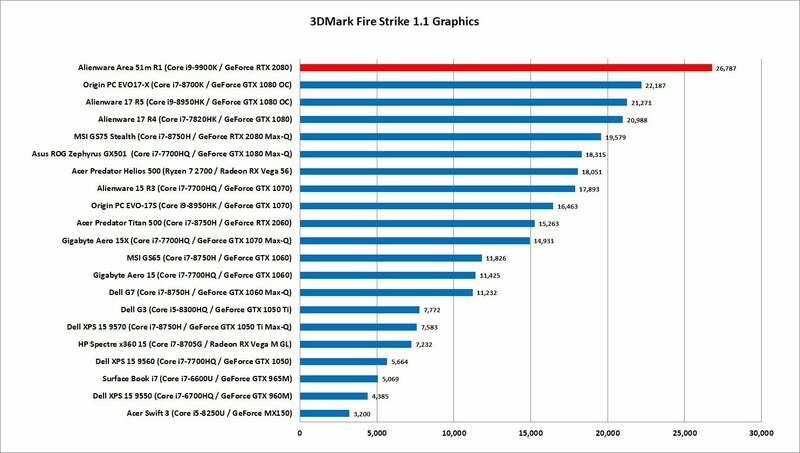 3DMark FireStrike dates back to 2013 and was intended as a strenuous synthetic test of that era's hardware. 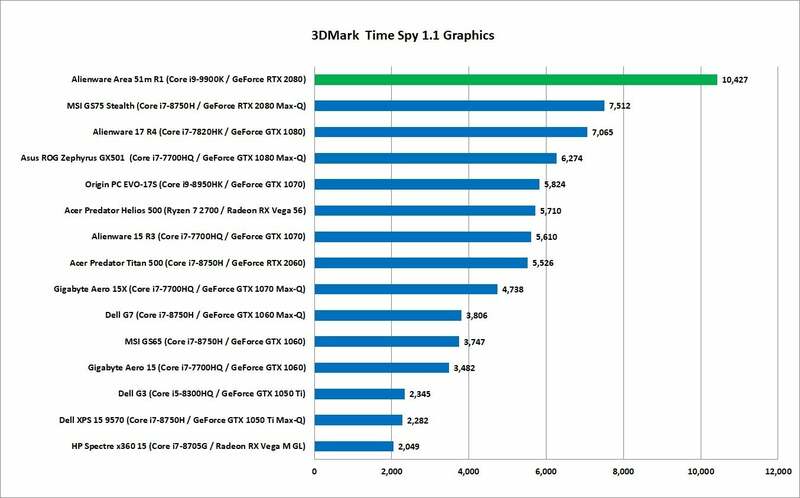 Much has changed since then, so we also wanted to see how the Area-51m's RTX 2080 did in the 2016-era 3DMark Time Spy test. This test is DX12, and as you can see from FutureMark's own documentation below, it uses a ton more shaders, tessellation, vertices, and triangles than FireStrike. 3DMark Time Spy uses far more modern graphics features than the 2013-era 3DMark FireStrike. With the heavier workload we see the Area-51m open up an even larger gap over all other laptops we've tested. For comparison, the Area-51m with its RTX 2080 is about 25 percent faster than the Alienware 17 R4 with GTX 1080. In Time Spy, the Area-51m is about 38 percent faster than the Alienware 17 R4. The DirectX 12-based 3DMark Time Spy uses a ton more shaders, tessellation and vertices than the DX11-based 3DMark Fire Strike. Unfortunately, we live in a world where benchmark graphics workloads may not match what developers are actually doing. They do, after all, have to make a living off selling a game, not a benchmark. Even though the Area-51m's RTX 2080 is demonstrably faster in a perfect world, in the real world it's closer than you'd hope for. 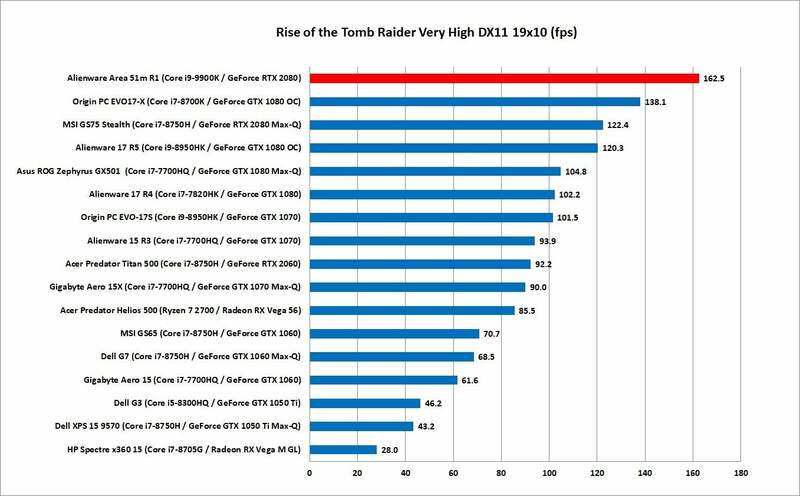 In Rise of the Tomb Raider set to Very High in DX11 mode at 1920x1080 resolution, you're looking at about a 30-percent difference between the Area-51m and the Alienware 17 R4. The full-tilt RTX 2080 easily outguns even overclocked GTX 1080 laptops. The RTX 2080 in the Area 51m easily outpaces even overclocked GTX 1080 GPUs, even at a relatively "low" resolution of 1920x1080. Our last test is Middle-earth: Shadows of Mordor, also run at 1920x1080, set to Ultra quality, and using the 4K texture pack. Again, the RTX 2080 smokes all that came before it. We'll be interested to see how the Area-51m's lead holds up as other full-tilt RTX 2080 come in for review, but it's likely going to be a tough one to beat. 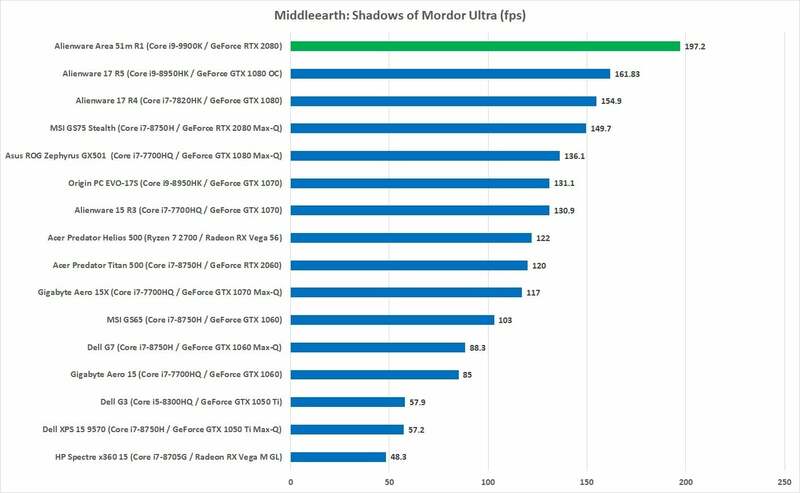 Running Middle-earth: Shadows of Mordor at 1920x1080 and Ultra quality, nothing can touch the Area-51m's RTX 2080. We take a view that laptop battery life is based on context. We know a heavy, thick gaming laptop will spend 95 percent of its life on AC. So, call us surprised when the Area-51m and its 90-watt-hour battery clocked in just short of 6 hours of runtime while playing a video with the screen set to 250 to 260 nits and the wireless switched off. That's surprisingly respectable given that the laptop has a G-sync-enabled 144Hz panel, which means the mighty RTX 2080 is always switched on. That's typically a major battery-killer. 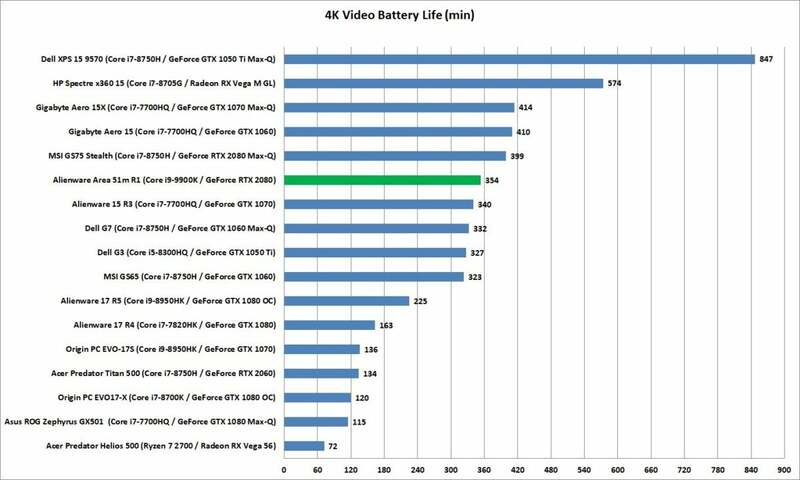 When you also factor in that the Area-51m has a desktop CPU and a desktop chipset, the Z390, we'd say this is amazing battery life—for video playback. Just a reminder: If you fired up that RTX 2080 for a game, or pushed the Core i9-9900K in a CPU-heavy task, don't expect more than an hour of run time if you're lucky. Battery life is surprisingly good considering the Alienware Area 51m R1 uses a desktop CPU and features G-Sync. What about ray tracing performance? Keep reading to find out. Alienware's redesigned powerhouse laptop promises the Holy Grail of gaming laptop features: It's big, fast, beautiful, and even upgradable, with a desktop CPU and a custom upgradable GPU design.